This starts at the intersection of Tanjil Bren Road and Lady Manner Sutton Road. The tack continues and becomes North Lady Manner Sutton Road and then turns into East Tanjil Jeep Track. Up to this point, the tracks would be classed as easy, with the odd medium bit. There are some steep ascents and descents and some samll rocky areas, but nothing too hard. East Tanjil Jeep Track then turns into Lady Manner Sutton South Track. The end of this track joins to the start of another track listed on the track database called LM ( Lady Manner ) South Sutton Track. 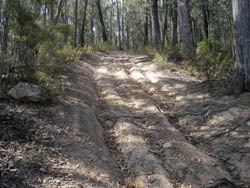 This last section of the track is the difficult bit. I would suggest that unless you have some serious modifications, this is only possible heading down hill. When we logged the previous track, we had to make a U turn as going up was not possible for us. The pictures do not do it justice. Met up with some locals who said that a Dandenong SES training session out here a few weeks back ended up with one of their vehicles rolling. It wouldn\'t suprise me. The track was done in the dry. Difficulty would increase to very difficult in the wet.